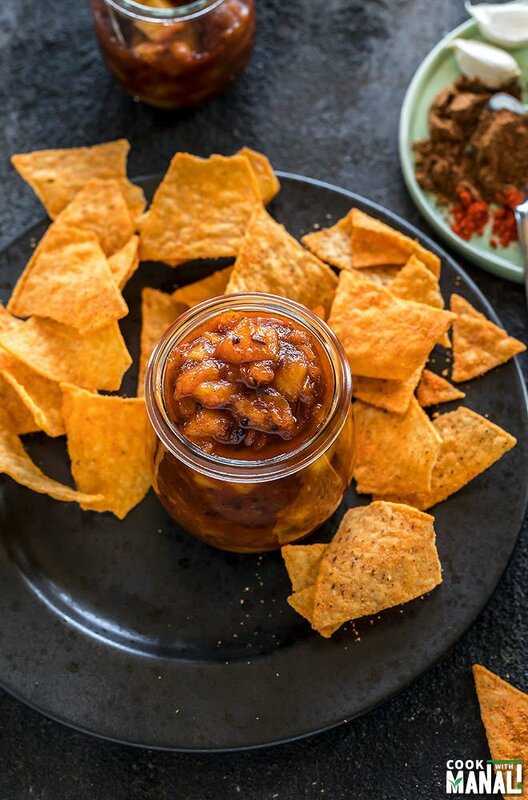 Make the most of peach season with this sweet and spicy Peach Chutney! 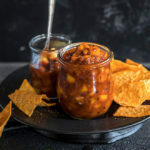 This versatile chutney goes well with almost anything and everything! Peach season is finally here! All year long, I look forward to the peach season but the sad part is that it ends pretty soon. I think it only lasts for a week or two. One week, the peaches are in the market and not really ripe and the next week they are super ripe. So ripe that if you buy a few pounds you can’t possibly finish all before some of them going bad. This is what exactly happened with me. We bought a huge box of peaches and there were all pretty ripe to begin with. While we were eating them everyday, there were still so many left and I just knew that I will have to toss them if I don’t do something with them. At first, I thought of baking with them. 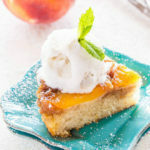 After all, the peach up side down cake is one of my absolute favorites but then I settled for this peach chutney. 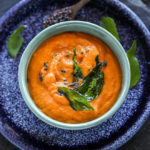 I love making chutneys with different ingredients and I thought the sweetness of the ripe peaches would go well with the Indian spices. And I was so right! The chutney turned out so delicious. 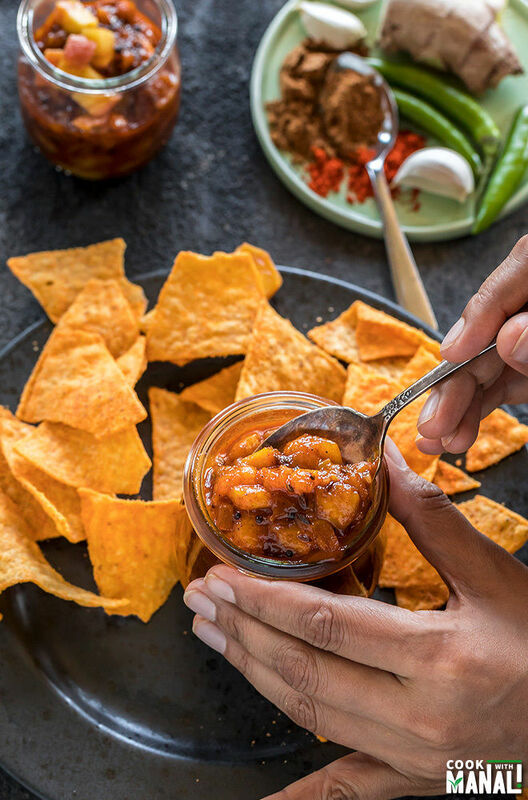 It’s sweet and spicy and pairs so perfectly with just about anything. I had mine with paratha and then later with rice and chole. It was so good both ways. 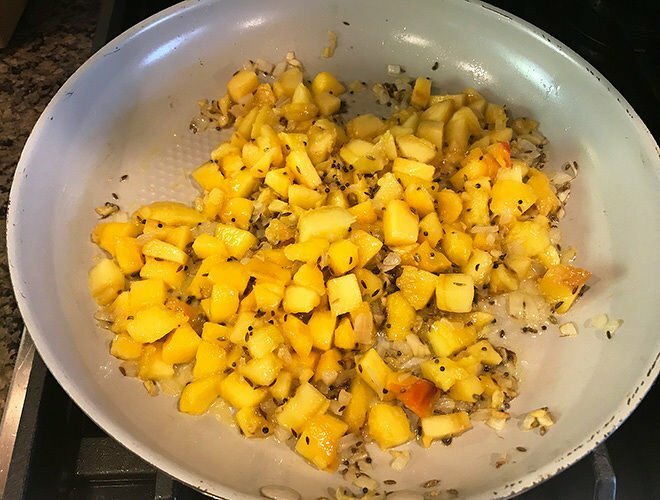 To make this chutney, I used very ripe peaches. It served 2 purposes, one I didn’t have to blanch the peaches to peel off the skin since it came out easily on its own. And two I didn’t have to use much sugar as the peaches were already very sweet. In case your peaches aren’t that ripe, you would need to boil the peaches in water for some time to remove their skin. 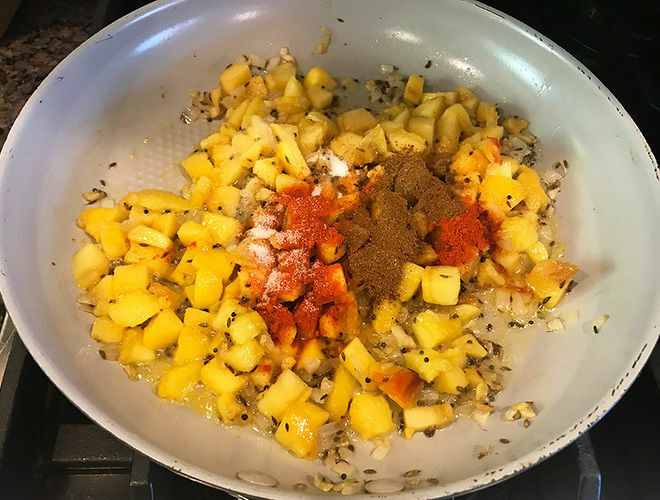 I have used very basic chutney spices for this peach chutney like cumin, mustard, fennel, red chili powder and garam masala. Of course there’s also lots of ginger and garlic. My chutney isn’t very spicy but you can always make it one by adding lots of chili powder and garam masala. 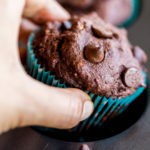 I wanted a balance flavor so I added just enough spices to match the sweetness – no more, no less! This peach chutney should stay good in the refrigerator for couple of weeks but I doubt it will last that long. 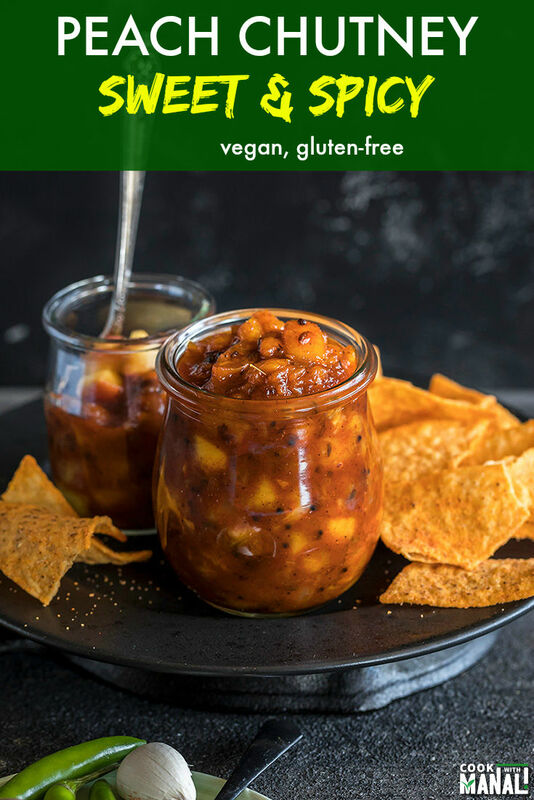 So in case you have lots of peaches at home and are not sure what to do with them, do give this chutney a try. 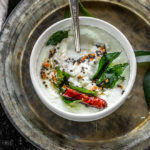 You will love the versatility of this chutney, it goes well with so many things! Heat oil in a pan on medium heat. 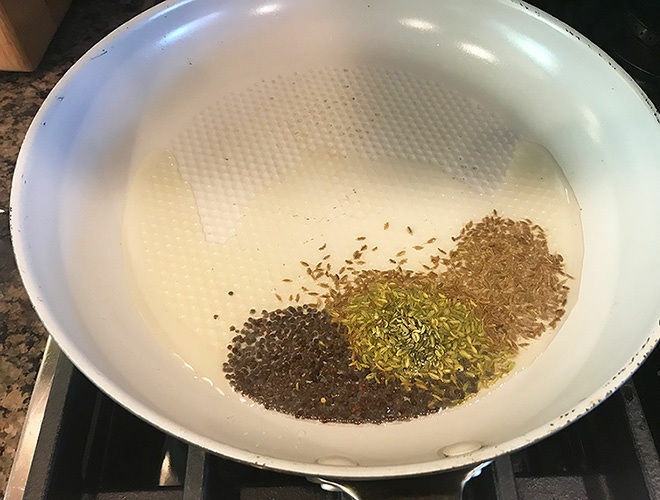 Once the oil is hot, add cumin seeds, fennel seeds and mustard seeds to it. Let the seeds sizzle, the mustard seeds should pop. 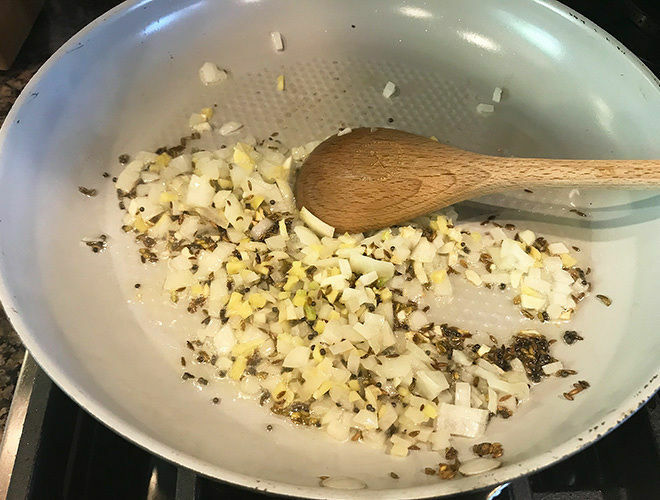 Then add the garlic, ginger, onion and cook for 3 to 4 minutes until onions are softened. Meanwhile peel the peaches, remove the pit and then chop them into small pieces. Add the chopped peaches into the pan. 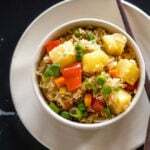 The peaches I used in this recipe were really ripe so the skin came out easily. In case your peaches aren’t this ripe, blanch them in boiling water for few minutes until the skin can be removed easily. Add in the garam masala, red chili powder, salt and white vinegar. Mix to combine and cook the spices with the peaches for a minute or two. Then add the sugar and mix. Keep stirring as the sugar melts. Cook on low-medium heat for 5 to 7 minutes until the peaches are really soft. Mash some of the peaches with the back of a spoon/spatula as the chutney gets cooked. 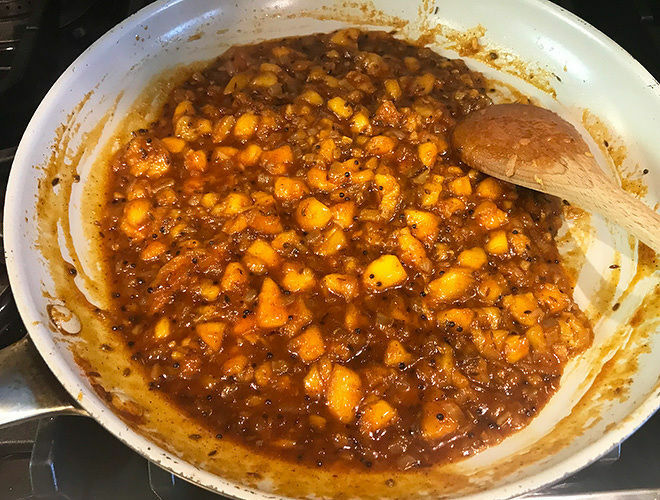 Once the peaches are really soft and chutney has reached a desirable consistency, remove the pan from heat. The chutney will thicken as it cools down so do not make it very thick to begin with. Since the peaches I used were very ripe, it only took around 5 to 7 minutes for them to get soft and mushy, the not so ripe ones may take more time. Let it cool down to room temperature and then serve. Keep the peach chutney refrigerated. It should be good for couple of weeks! 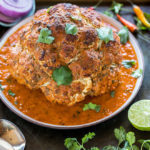 Check out more chutney recipes on the blog! 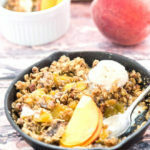 If you’ve tried this Peach Chutney Recipe then don’t forget to rate the recipe! You can also follow me on Facebook and Instagram to see what’s latest in my kitchen! 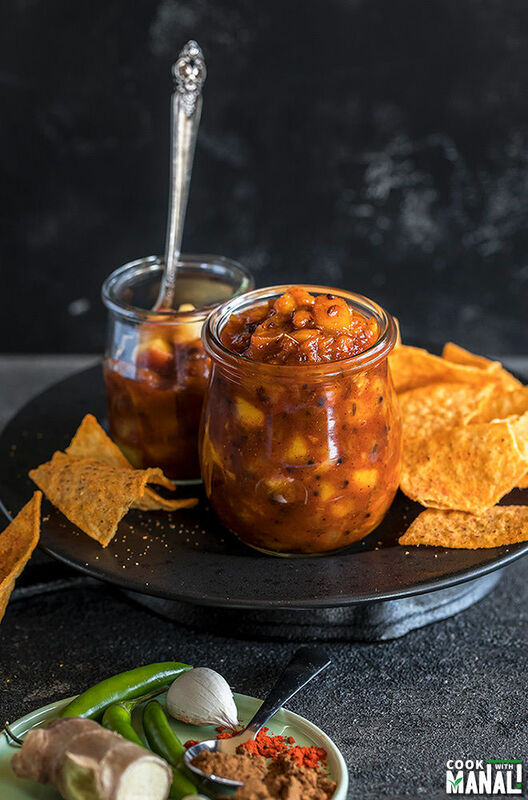 Sweet and spicy Peach Chutney is a great way to use in-season ripe peaches! 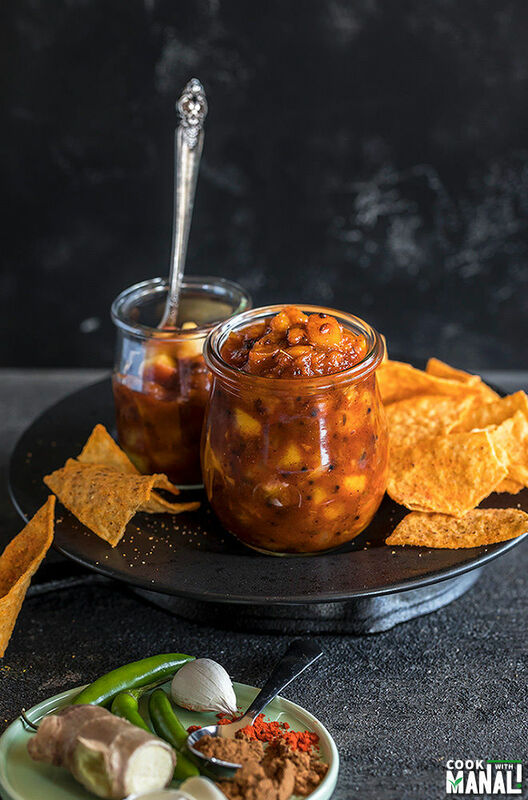 This flavorful chutney pairs well with any meal and can also be served as an appetizer. 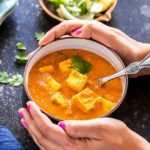 I love eating it with paratha (Indian flat bread)! The peaches I used in this recipe were really ripe so the skin came out easily. In case your peaches aren't this ripe, blanch them in boiling water for few minutes until the skin can be removed easily. You might need to add more sugar if your peaches aren't very sweet. 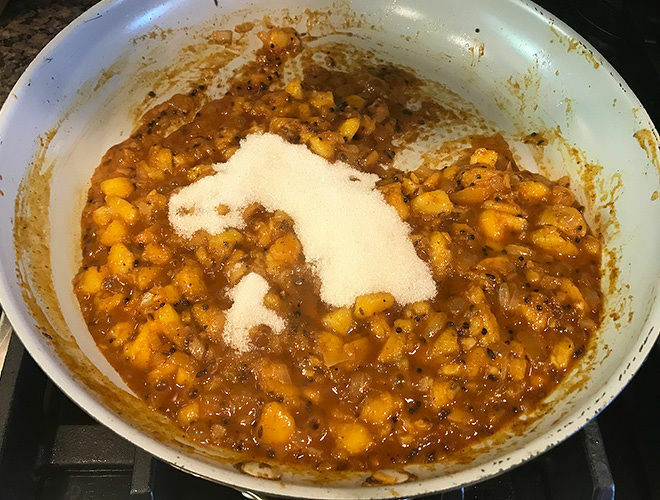 Add more of garam masala and red chili powder for a spicier chutney.